The state of conservation biology is most often defined in terms of what is known about terrestrial ecosystems. Contrary to what can sometimes be read in that literature, the largest stumbling block on the way to successful biodiversity management and conservation in aquatic ecosystems is the lack of quantitative baseline data, and the associated ignorance about diversity under the water surface. In the absence of data, goals are often set as qualitatively defined “reference conditions”, an approach that can be subjective, that risks broad brush generalisation and suffers from the shifting baseline syndrome. To combat these issues we launched several large integrated biodiversity mapping efforts for fish in Switzerland, Projet Lac in 2010, and more recently Progetto Fiumi. Our second focus is on the population genetics and ecology of invasion and range expansion on the one hand, and decline and extinction on the other. Here we study Threespined stickleback at the invasion front north of the Alps and at the extinction front south of the Alps, and we study rheophilic fish species that are rapidly declining and approaching extinction in Switzerland. In Projet Lac we collect and compile quantitative baseline data for most large lakes of Switzerland and neighboring countries. We designed methods for a full quantitative sampling design and applied them to twenty six medium to large and deep to very deep lakes. Our aim is to document and assess fish diversity at all its fundamental levels. This includes individual genetic and phenotypic diversity for key taxa, species diversity and abundance, community diversity by habitats and whole lake diversity. A large state-of-the-art collection of pre-alpine fish is being established at the Natural History Museum in Bern. We are now analyzing the species distribution and abundance data and are beginning to collect phenotypic and genetic data. Eventually we will use the data to try and explain some of the large changes in species diversity and distribution observed over the last decades, and we want to understand if these changes affect ecosystem functions. Progetto Fiumi is built to achieve the same for many streams and rivers in Switzerland. After a decade of research in our group on the distribution, origin and loss of endemic whitefish in the northern prealpine lakes of Switzerland we have now entered a phase, where we want to compile all we have learned into a compendium for fisheries managers. To make conservation-minded management effective, the species have to be recognized, defined and named. Our research had led to the realization that there are several yet undescribed and unnamed species of Coregonus in Switzerland. We are now in the process of describing these in the context of a systematic revision of the genus in Switzerland. This is a Bafu/Eawag funded project that we do in collaboration with AquaBios. Species diversity can be lost through two different but potentially interacting extinction processes: demographic decline and speciation reversal through introgressive hybridization. To investigate the relative contribution of these processes, we analysed historical and contemporary data of replicate whitefish radiations from 17 pre-alpine European lakes and reconstructed changes in genetic species differentiation through time using historical samples. Here we provide evidence that species diversity evolved in response to ecological opportunity, and that eutrophication, by diminishing this opportunity, has driven extinctions through speciation reversal and demographic decline. Across the radiations, the magnitude of eutrophication explains the pattern of species loss and levels of genetic and functional distinctiveness among remaining species. We argue that extinction by speciation reversal may be more widespread than currently appreciated. Preventing such extinctions will require that conservation efforts not only target existing species but identify and protect the ecological and evolutionary processes that generate and maintain species. Background: Speciation reversal: the erosion of species differentiation via an increase in introgressive hybridization due to the weakening of previously divergent selection regimes, is thought to be an important, yet poorly understood, driver of biodiversity loss. 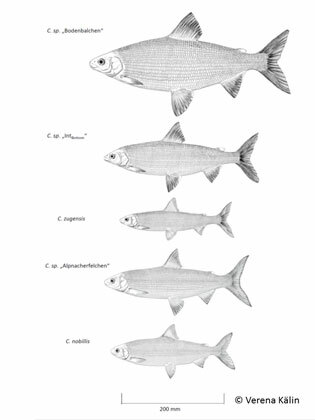 Our study system, the Alpine whitefish (Coregonus spp.) species complex is a classic example of a recent postglacial adaptive radiation: forming an array of endemic lake flocks, with the independent origination of similar ecotypes among flocks. However, many of the lakes of the Alpine radiation have been seriously impacted by anthropogenic nutrient enrichment, resulting in a collapse in neutral genetic and phenotypic differentiation within the most polluted lakes. Here we investigate the effects of eutrophication on the selective forces that have shaped this radiation, using population genomics. We studied eight sympatric species assemblages belonging to five independent parallel adaptive radiations, and one species pair in secondary contact. We used AFLP markers, and applied FST outlier (BAYESCAN, DFDIST) and logistic regression analyses (MATSAM), to identify candidate regions for disruptive selection in the genome and their associations with adaptive traits within each lake flock. The number of outlier and adaptive trait associated loci identified per lake were then regressed against two variables (historical phosphorus concentration and contemporary oxygen concentration) representing the strength of eutrophication. Results: Whilst we identify disruptive selection candidate regions in all lake flocks, we find similar trends, across analysis methods, towards fewer disruptive selection candidate regions and fewer adaptive trait/candidate loci associations in the more polluted lakes. Conclusions: Weakened disruptive selection and a concomitant breakdown in reproductive isolating mechanisms in more polluted lakes has lead to increased gene flow between coexisting Alpine whitefish species. We hypothesize that the resulting higher rates of interspecific recombination reduce either the number or extent of genomic islands of divergence surrounding loci evolving under disruptive natural selection. This produces the negative trend seen in the number of selection candidate loci recovered during genome scans of whitefish species flocks, with increasing levels of anthropogenic eutrophication: as the likelihood decreases that AFLP restriction sites will fall within regions of heightened genomic divergence and therefore be classified as FST outlier loci. This study explores for the first time the potential effects of human-mediated relaxation of disruptive selection on heterogeneous genomic divergence between coexisting species. Several rheophilic fish species of the prealpine grayling and trout zones are experiencing dramatic population declines and rapid population extinction at a stage before quantitative assessment of genetic, functional and taxonomic diversity. Trying to provide such data, we have been studying four taxa. 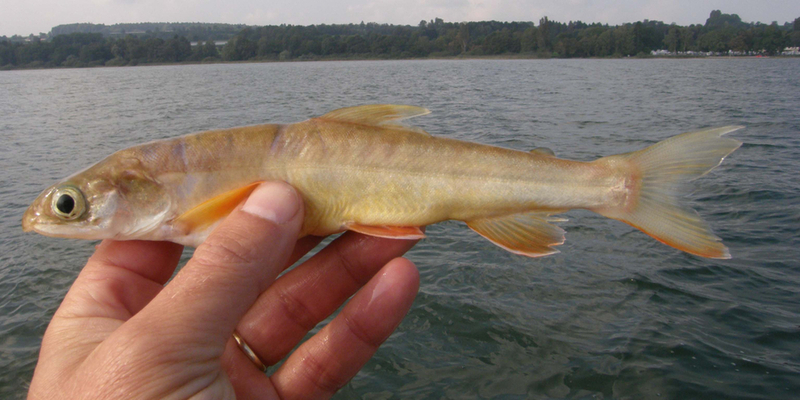 The first was the enigmatic Nase or Nose carp (Chondrostoma nasus), perhaps the most rapidly declining fish of Swiss rivers. We documented a deep genetic break between populations in the Lake Constance drainage and those in the rest of the Rhine catchment. We also demonstrated phenotypic variation, possibly associated with river size, and evidence of a genetic bottleneck in one population. Based on these findings we made recommendations for management. Further, we are studying grayling populations in some parts of Switzerland in a similar framework, another species that declines for reasons that are not entirely clear. We are studying native trout of Mediterranean lineages, and the conditions of coexistence with or displacement by introduced Atlantic trout. Finally, we study bullhead (sculpins, Cottus gobio), a little benthic species that is of no commercial interest and supposedly has not been much affected by human translocation. Chondrostoma nasus is a cyprinid fish with highly specialized, ecologically and geographically distinct, ontogenetic trophic niches. Nase population numbers across their Swiss range have shown massive declines and many localized extinctions. In this study, we integrate genetic data (AFLP, microsatellite, mtDNA sequence) with phenotypic and demographic analyses to survey patterns of neutral and adaptive genetic diversity in all extant (and one extinct) Swiss nase populations, with the aim to delineate intraspecific conservation units (CUs) and to inform future population management strategies. We discovered two major genetically and geographically distinct population groupings. The first population grouping comprises nase inhabiting rivers flowing into Lake Constance; the second comprises nase populations from Rhine drainages below Lake Constance. Within these clusters there is generally limited genetic differentiation among populations. Genomic outlier scans based on 256 to 377 polymorphic AFLP loci revealed little evidence of local adaptation both within and among population clusters, with the exception of one candidate locus identified in scans involving the low genetic diversity Schanzengraben population. However, significant phenotypic differentiation in body shape between certain populations suggests a need for more intensive future studies of local adaptation. Our data strongly suggests that the two major population groups should be treated as distinct CUs, with any supplemental stocking and reintroductions sourced only from within the range of the CU concerned. We have been working for several years now on the genetics and ecology of invasion of the Swiss midlands by Threespined stickleback. The invasion took place in the last 150 years and was associated with massive expansion of the ecological range of the species. In much of the Mediterranean region, stickleback were simultaneously declining rapidly to the extent that they are extinct or nearly extinct in many places and enjoy protected species status. We have more recently started to work on these isolated Mediterranean relict populations, hoping to make a little contribution to documenting diversity and adaptive potential. The occurrence of contemporary ecotype formation through adaptive divergence of populations within the range of an invasive species typically requires standing genetic variation but can be facilitated by phenotypic plasticity. The relative contributions of both of these to adaptive trait differentiation have rarely been simultaneously quantified in recently diverging vertebrate populations. Here we study a case of intraspecific divergence into distinct lake and stream ecotypes of threespine stickleback that evolved in the past 140 years within the invasive range in Switzerland. Using a controlled laboratory experiment with full-sib crosses and treatments mimicking a key feature of ecotypic niche divergence, we test if the phenotypic divergence that we observe in the wild results from phenotypic plasticity or divergent genetic predisposition. Our experimental groups show qualitatively similar phenotypic divergence as those observed among wild adults. The relative contribution of plasticity and divergent genetic predisposition differs among the traits studied, with traits related to the biomechanics of feeding showing a stronger genetic predisposition, whereas traits related to locomotion are mainly plastic. These results implicate that phenotypic plasticity and standing genetic variation interacted during contemporary ecotype formation in this case. When genetic constraints restrict phenotypic evolution, diversification can be predicted to evolve along so-called lines of least resistance. 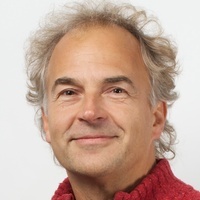 To address the importance of such constraints and their resolution, studies of parallel phenotypic divergence that differ in their age are valuable. Here, we investigate the parapatric evolution of six lake and stream threespine stickleback systems from Iceland and Switzerland, ranging in age from a few decades to several millennia. Using phenotypic data, we test for parallelism in ecotypic divergence between parapatric lake and stream populations and compare the observed patterns to an ancestral-like marine population. We find strong and consistent phenotypic divergence, both among lake and stream populations and between our freshwater populations and the marine population. Interestingly, ecotypic divergence in low-dimensional phenotype space (i.e. single traits) is rapid and seems to be often completed within 100 years. Yet, the dimensionality of ecotypic divergence was highest in our oldest systems and only there parallel evolution of unrelated ecotypes was strong enough to overwrite phylogenetic contingency. Moreover, the dimensionality of divergence in different systems varies between trait complexes, suggesting different constraints and evolutionary pathways to their resolution among freshwater systems. Although rapid phenotypic evolution during range expansion associated with colonization of contrasting habitats has been documented in several taxa, the evolutionary mechanisms that underlie such phenotypic divergence have less often been investigated. A strong candidate for rapid ecotype formation within an invaded range is the three-spine stickleback in the Lake Geneva region of central Europe. Since its introduction only about 140 years ago, it has undergone a significant expansion of its range and its niche, now forming phenotypically differentiated parapatric ecotypes that occupy either the pelagic zone of the large lake or small inlet streams, respectively. By comparing museum collections from different times with contemporary population samples, we here reconstruct the evolution of parapatric phenotypic divergence through time. Using genetic data from modern samples, we infer the underlying invasion history. We find that parapatric habitat-dependent phenotypic divergence between the lake and stream was already present in the first half of the twentieth century, but the magnitude of differentiation increased through time, particularly in antipredator defence traits. This suggests that divergent selection between the habitats occurred and was stable through much of the time since colonization. Recently, increased phenotypic differentiation in antipredator defence traits likely results from habitat-dependent selection on alleles that arrived through introgression from a distantly related lineage from outside the Lake Geneva region. This illustrates how hybridization can quickly promote phenotypic divergence in a system where adaptation from standing genetic variation was constrained. The relative importance of ecological selection and geographical isolation in promoting and constraining genetic and phenotypic differentiation among populations is not always obvious. Interacting with divergent selection, restricted opportunity for gene flow may in some cases be as much a cause as a consequence of adaptation, with the latter being a hallmark of ecological speciation. Ecological speciation is well studied in parts of the native range of the three-spined stickleback. Here, we study this process in a recently invaded part of its range. Switzerland was colonized within the past 140 years from at least three different colonization events involving different stickleback lineages. They now occupy diverse habitats, ranging from small streams to the pelagic zone of large lakes. We use replicated systems of parapatric lake and stream populations, some of which trace their origins to different invasive lineages, to ask (i) whether phenotypic divergence occurred among populations inhabiting distinct habitats, (ii) whether trajectories of phenotypic divergence follow predictable parallel patterns and (iii) whether gene flow constrains divergent adaptation or vice versa. We find consistent phenotypic divergence between populations occupying distinct habitats. This involves parallel evolution in several traits with known ecological relevance in independent evolutionary lineages. Adaptive divergence supersedes homogenizing gene flow even at a small spatial scale. We find evidence that adaptive phenotypic divergence places constraints on gene flow over and above that imposed by geographical distance, signalling the early onset of ecological speciation. Rapid phenotypic diversification during biological invasions can either arise by adaptation to alternative environments or by adaptive phenotypic plasticity. Where experimental evidence for adaptive plasticity is common, support for evolutionary diversification is rare. Here, we performed a controlled laboratory experiment using full-sib crosses between ecologically divergent threespine stickleback populations to test for a genetic basis of adaptation. Our populations are from two very different habitats, lake and stream, of a recently invaded range in Switzerland and differ in ecologically relevant morphological traits. We found that in a lake-like food treatment lake fish grow faster than stream fish, resembling the difference among wild type individuals. In contrast, in a stream-like food treatment individuals from both populations grow similarly. Our experimental data suggest that genetically determined diversification has occurred within less than 140 years after the arrival of stickleback in our studied region. The three-spined stickleback is a widespread Holarctic species complex that radiated from the sea into freshwaters after the retreat of the Pleistocene ice sheets. In Switzerland, sticklebacks were absent with the exception of the far northwest, but different introduced populations have expanded to occupy a wide range of habitats since the late 19th century. A well-studied adaptive phenotypic trait in sticklebacks is the number of lateral plates. With few exceptions, freshwater and marine populations in Europe are fixed for either the low plated phenotype or the fully plated phenotype, respectively. Switzerland, in contrast, harbours in close proximity the full range of phenotypic variation known from across the continent. We addressed the phylogeographic origins of Swiss sticklebacks using mitochondrial partial cytochrome b and control region sequences. We found only five different haplotypes but these originated from three distinct European regions, fixed for different plate phenotypes. These lineages occur largely in isolation at opposite ends of Switzerland, but co-occur in a large central part. Across the country, we found a strong correlation between a microsatellite linked to the high plate ectodysplasin allele and the mitochondrial haplotype from a region where the fully plated phenotype is fixed. Phylogenomic and population genomic analysis of 481 polymorphic amplified fragment length polymorphism loci indicate genetic admixture in the central part of the country. The same part of the country also carries elevated within-population phenotypic variation. 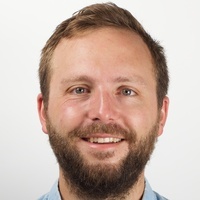 We conclude that during the recent invasive range expansion of sticklebacks in Switzerland, adaptive and neutral between-population genetic variation was converted into within-population variation, raising the possibility that hybridization between colonizing lineages contributed to the ecological success of sticklebacks in Switzerland.